Throughout the construction process we can offer a wide variety of services via our bulk water tankers. Available in volumes of 10,000, 15,000 & 30,000 litres our tankers can assist either via one bulk delivery into a site tank or by remaining on site for a number of hours at a time to provide the water as and when it is required. Should access be an issue for our tankers to attend your site, we can even operate a 2,000 litre bowser towed by a 4×4. Our range of static water tanks and on demand pumps, we can ensure an uninterrupted supply of water to your site. Our tanks, which come in volumes of 1,100, 1,800 and 10,000 litres can either stand alone or be connected to and supplied by a mains supply on site. 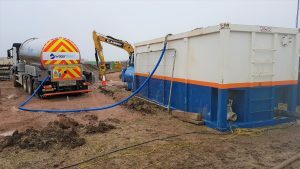 As well as being able to supply your site with drinking water, we can connect our static tanks to your site welfare units, ensuring you have a clean supply to your showers, toilets, hand washing and kitchen facilities. We can also attend site to disinfect and chlorinate any pipe work on site that is not suitable for clean drinking water or that will be used to connect up to a mains supply. We take samples from the chlorinated pipe work and issue UKAS accredited certification once the results have been received back from the laboratories.